Taeyeon has secured the No. 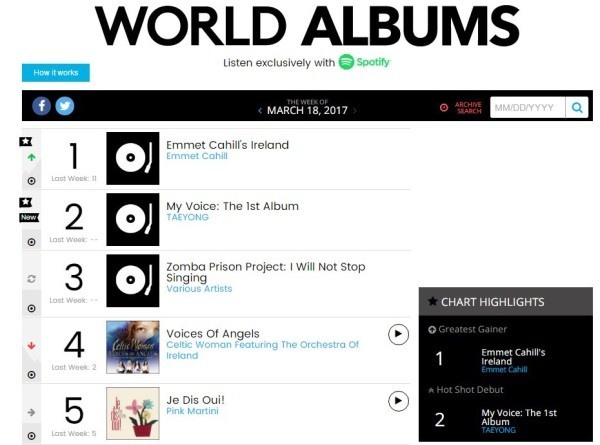 2 spot on Billboard’s World Albums chart with her first full-length album “My Voice” for the week of March 18. This marks the second time the singer made it on the chart after her first solo EP “I” topped the chart in October 2015. Her latest album’s lead track “Fine” topped local music charts within four hours of its release on Feb. 28. The song also did well on 12 iTunes album charts in different countries, including Finland, Singapore, Hong Kong and Vietnam on the same day.